location. Different ambiance but still Counter Culture and still great coffee. Until recently, most of my trips to the New York City vicinity involved simply a hike to Manhattan and not much else. But then my brother decided to move to Jersey City and then again to Hoboken, so the next time my whole family decided to visit I made sure to make use of the opportunity to also check out the local coffee. After a look on cyberspace, I set my aim on what looked like a cute place called Dames Coffee Espresso Bar. The location fortunately proved convenient to a lunch stop in downtown Hoboken and thus, after a nice lunch we all marched down to grab some coffee. Dames possesses a bright, blue brick exterior with an attractive custom awning that reminds me of a Greek restaurant (probably the font stylings). The interior is cozy; a nice white and blue decor scheme complete with nice chandelier light fixtures and few pieces of seating. The coffee comes from Counter Culture Coffee, usually a good sign of quality in at least the drip. I purchased a cup of Ethiopian (not sure whether it was the Yirg or the Idido), which embodied a sweet rum taste with a nice acidity, though also a tid bit stale; a decent cup of drip. The espresso, pulled magnificently and short, had a nice white chocolaty taste up front and finished with a pleasant sour note reminiscent of rhubarb. I didn't note the tea. Thus, the trip to Dames has provided yet another reason to visit the lovely area of Hoboken (as well as me brother). 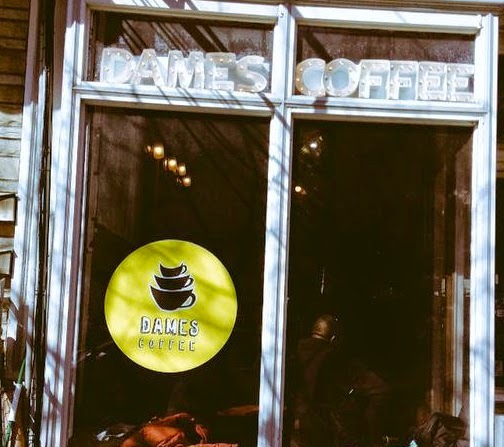 If you're in town, give Dames Coffee Espresso Bar a shot or two.